ASTANA – Young Kazakh golfer Daulet Tuleubayev from Almaty has joined the Stanford University golf team. The athlete will continue his education and sports career at the American university with a 100-year history, according to the official website of Stanford University. The talented 18-year-old athlete was invited to enroll in about 20 universities in the U.S.: Harvard University, the University of Berkeley, Princeton, Duke University and many others. But Tuleubayev chose Stanford, where he will study and compete in the National Association of Student Sports (NCAA). He is the first Kazakh golfer to take part in the American student sport system. It should be noted that Kazakh athletes have been monitored by American universities for a long time. 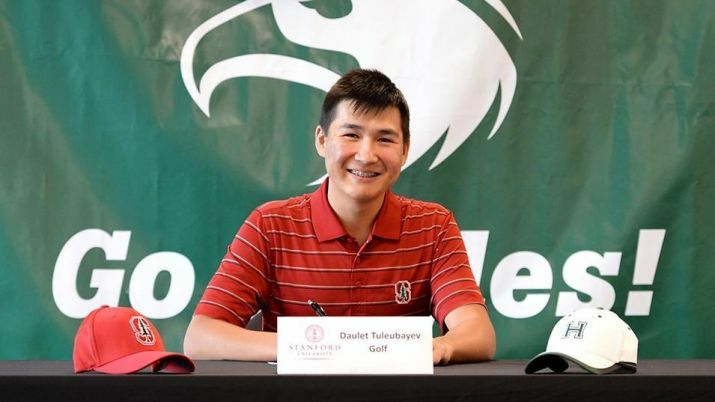 Tuleubayev has successfully competed in junior and adult tournaments and last summer became the first Kazakh athlete and golfer from the Commonwealth of Independent States (CIS) to qualify for the U.S. Amateur golf tournament. Together with Tuleubayev, Stanford University also invited two more golfers to the team: Australian Fred Lee and American Ethan Nji. In total, the Stanford University golf team includes 12 people; two or three members leave every year as they graduate from the university and young and promising golfers are invited to replace them. Stanford University has one of the strongest university golf teams – Tiger Woods, one of the greatest golfers of all time, played for Stanford for two years. More than 20 Stanford golfers are in the University’s Hall of Fame, and four of them have won the National Championship of the U.S. The history of golf development in Kazakhstan started a little more than 20 years ago. Golf in Kazakhstan has appeared and is developing thanks to the support and active participation of Kazakh President Nursultan Nazarbayev with practical help provided by Russian golf professionals Alexander Strunkin and Konstantin Lifanov. As of today, there are seven golf clubs, one golf resort and a golf academy for children in the state. Stanford was established in 1891 and is often at the top of many American ranking measures. In polls done by the Princeton Review in 2013, 2014, 2015, 2016 and 2017, Stanford was called the most commonly named dream college for students. The Academic Ranking of World Universities (ARWU) ranked Stanford second in the world most years from 2003 to 2016.